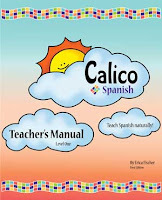 Here at Kids Immersion, LLC, we are thrilled that teachers thoroughly appreciate Calico Spanish because it provides tools, resources and extensive guidance that allow teachers to implement The Natural Approach* to language learning in their classrooms. Teaching Spanish with great visual aids and using Spanish to communicate messages kids can comprehend allows students to acquire Spanish naturally and quickly. Check out our samples and see for yourself that Calico Spanish is the right choice for your students! *See The Natural Approach: Language Acquisition in the Classroom by Stephen Krashen and Tracy Terrell. Copyright Prentice Hall Europe. First published in 1983.